I’ve said it before and I’ll say it again. I am a fan of any product that helps cut down on the time I spend in front of the mirror in the morning. Here is the first of what I hope to be more roundups of my favorite multi-taskers. Any product that includes sunscreen gets my attention. I have tried and liked many, but Clinique’s new, fragrance-free even better with an SPF20 is high on my list. 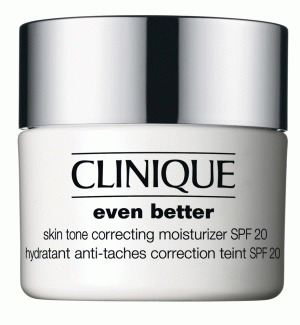 It is a skin tone correcting moisturizing cream that provides a nice glow when applied. It offers deep hydration and, after four to six weeks, diminishes dark spots and evens out skin tone. The high level UBA/UVA protection helps prevent future dark spots. Ingredients include octisalate, which is used as a UVB blocker, as well as a deep delivery system, and avobenzone, one of the few chemical sunscreens that absorbs the full UVA spectrum. Both chemicals are widely used and generally considered to be among the safer sun protection ingredients. even better costs about $45 for a 1.7 oz jar. If you are looking for more protection, Kinerase’s Daily Defense Cream is also another great morning skin cream with SPF30. It uses the same ingredients, plus others, for sun protection, but also includes .1% N6-furfuryladenine, or Kinetin. This plant hormone serves as a powerful antioxidant. When I used Kinerase on a regular basis, it was effective at minimizing small wrinkles. It’s fragrance free, hypoallergenic, and while quite expensive at $135 for 2.8 oz, this product delivers on its promise as anti-aging sun protection. Per-fekt offers two-in-one products that work great for me. If you prefer not to wear foundation but find you do like a bit of color, their Skin Perfection Gel is awesome! It has that silky texture that is so popular now and comes in five shades. While it helps maintain moisture, this is not for dry skin. It’s a great alternative to foundation or powder, instantly smoothing out tone and reducing fine lines and larger pores. They claim it gives an airbrushed yet natural look, and it actually does! Per-fekt’s Eye Perfection Gel is even better; I really liked this product. It is an eye treatment, soothing and hydrating with cucumber extracts, antioxidants and peptides, but it also contains a light-reflecting tint that reduces the appearance of puffy eyes, fine lines and under-eye shadows. Skin Perfection runs about $60 for 1 oz, and Eye Perfection is $45 for .3 oz. A little goes a long way with these two products.